PALINI R. SWAMY writes from Bangalore: The pre-monsoon showers are bringing relief from the summer heat but the escalating political heat is showing no signs of abating in Karnataka. A month is left in the poll calendar for the completion of voting. It was only yesterday that the major parties, Congress, BJP and JD (S) released their first list of candidates. But that hasn’t stopped the media from already getting into the prediction business. Consider this. While we know that BJP’s path to reelection is filled with obstacles and the election fundamentals appear to favour the Congress at the moment, we do not know much about the micro factors and other such variables, which determine election results. # We do not know the full slate of candidates in each constituency. # We do not know the caste calculations particularly how a specific candidate might take away votes from others. # We do not know the expenditure threshold (the upper limit of money to be spent) of a given candidate. # We do not know about variables such as migrant workers who are away in cities seeking work because of drought. So, what determines the elections then is who has a better ground game, as the American psephologists say. For example, consider the case of migrant workers who have gone to Bangalore, Mysore, Poona or any one of the cities seeking employment. We are already hearing reports of agents who will verify the voters list, compile the names and mobile numbers of those who are away for employment, contact them, provide them with the right incentives and bring them back to their native place the before the elections and get them to vote. All this for a fee. This is an election management issue and the ones who have actually booked the most efficient agents will have an edge in a massively competitive election. 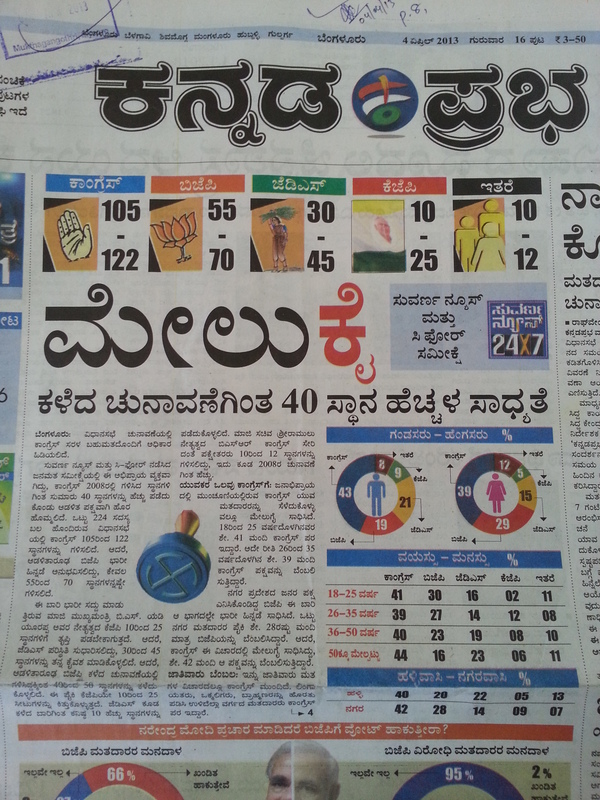 Still the Suvarna News– CFore survey and the Headlines Today-C-Voter survey predict a substantial victory for Congress. To be sure, if you ask any competent follower of Karnataka politics, he will quite possibly reach the same conclusions as both these polls. Thus Congress will probably secure 100-125 seats, whereas BJP might win in 55-70 constituencies, with JD (S) coming third, winning 30-45 seats. Others might get 20-30 seats. So what’s the value of these polls? You tell us. If you want to get fairly reliable election prediction, ask the bookies who run betting syndicates. But as the early reports indicate even there betting seems to be focusing more on who actually might get tickets and so on. That should tell us elections are far off. And the factors that determine the elections aren’t set yet. The summer is about to get hotter despite the occasional showers. Also read: POLL 2013: Has A. Ramdas not supplied ‘henda‘? Will Narendra Modi lead the BJP campaign in Karnataka? This entry was posted in Issues and Ideas, Kannada & Karnataka and tagged BJP, CFore, Churumuri, Congress, Headlines Today, JDS, Kannada Prabha, Narendra Modi, Palini R. Swamy, Sans Serif, Suvarna News. Bookmark the permalink. ← Sirf dekhneka, or IPL will sue the hell out of you! Also Modi factor may hurt Congress in coastal belt where Congress is expected to sweep. JDS is ignored by pollsters but could give a tough fight to Congress in North Karnataka and Mysore belt. BJP is going to lose for sure, but Congress may very well end up short, which could make Yeddy a king maker. Looks like whatever happens in the election, Yeddy could end up winner. KJP will get 150 places and no coalition will be formed. Yeddy will not become CM but will be sitting like Sonia. this article is written to tell people to vote for congress. since bjp is wrong they want congress . they are not showing how congress is doing at centre. Whichever party wins or hung assembly people of Karnataka will suffer. BJP has ruined democracy. Corruption and lavish spending for the comforts of Ministers, Chairman and Government officials distribution of tax payers money to Religious Institutions and new kind of NGO’s floated by politicians have become the order of the day. Whichever party comes to power will continue this trend in future without any fear, BJP has shown the way. Independent candidates will make money for withdrawing nominations as well as by selling them selves if they win. Even god cannot save this country, if he exists. My guess is Congress being leader-less, BJP being in a mess, JD has a chance. In case of Cong not getting a clear majority, it will seek JD’s support in the usual grand name of keeping the communal forces away. So HDK will try to be a king maker if he cannot himself become the king. With the gap between the 1st and 2nd party being 20%, it suggests that it is going to be massive sweep for the 1st party which , in this case is the Congress. @ Simple, by the way, who is likely to become CM? Or rather, who is being projected as CM? Congress already had 36% vote share in previous election. Even if it improves a few percentage – it’ll reach your number. BJP will get far higher seats than 28. Certainly more than JD(S). People think Congress was weak in Karnataka, it wasn’t. It has consistently led the vote share in Karnataka for a long long time. It looses because its votes are spread out, where as JD(S) and BJP are concentrated in pockets to give better results. So, congress is in luck this time, because the split in votes is happening within their strong pockets. But then, ‘Senorita’ and ‘erede apparente’ may have other thoughts and may choose some other ‘schiavo’ who is more pliant. The ideology of the party is important, not the person who leads the party. Congress has never projected anybody in the past. But history has showed that people who least expect the top post get it. Like MMS, Like Narasimha Rao, like Deve Gowda, Like IK Gujral, Like Dharam Singh, Like so on and so forth. BJP lacks candidates for few key areas….. but modi factor surely give some boost…. Congress lacks leader and if they want to win the chair they have to win atleast 20 seats in bangalore coz BJP is very strong in bangalore..
JDS same they may get 35 seats..and they may tie with BJP to make govt…suppose siddu lose they’ll tie with congress..
BJP = 75 TO 80. Well, I am not trying to predict who will form the government in Karnataka. Sure, Congress will be leading. It may get a massive majority or may even fall short of a simple majority. According to me BJP will not only be defeated, it may start getting wiped out from Karnataka. Next election will be the beginning of BJP’s end. But that doest mean BJP will disappear from Karnataka for the next 15 years. It will remain a strong force at least for 10 to 15 years. To understand next post poll election scenario, one has to understand the back ground of the present mass base of each political parties. 3) Masjid politics polarized indian society and BJP got benefited. 4) Long years of enjoying power alienated Congress from poor and it became party of business interests and corrupt. Upper castes shifted to BJP, OBCs shifted to Janata Parivar or regional outfits, SCs moved towards BSP in certain areas. During the emergency, Congress became the camp of autocrats and it got completely isolated from masses. After neo-liberalist governance, it becamse the party of Corporates and rural masses started hating Congress. 5) Communists started disintegrating in India after CPM embraced Neo-liberalism and as a result of this there is absolutely noone to give voice to poor. 6) In Karnataka’s context, when ever Lingayat leaders from North and Vokkaliga leaders of Old mysore region come together, they become a significant force. But after the demise of JH Patil (and after RK Hegde became too much obsessed with himself and almost became paranoid due to envy etc), Lingayat community members moved towards BJP. 7) Muslims started disliking Congress but when a relatively short sighted political busienssman, Kumaraswamy embraced BJP, they once again moved back to Congress. 8) when a clever SM Krishna manipulated a relatively naive Siddaramaiah, he played Caste card from the first time in Karnataka and took large number of Kuruba community members to Congress. His decision was also influenced by the facts that, Businessman politician Kumaraswamy is younger and more efficient than him. Sidharamaiah is honest and upright but he has big negatives. Many Kurubas are not with him now. 9) When Deve Gowda refused to give CM post to Yeddi, BJP played caste card and was successful in polarrizing Lingayate votes. A little more than half of Lingayats are now with Yeddi, but neither lingayats community members nor even Yeddy consider JD-s as their arch rival. Some of the (traditionally anti-congress minded section) lingayat members may votes for JD-s in the north where ever KJP doesnt have winnability. This is more true about the constituencies where JD-S field strong LIngayat candidate who have influence in the local level. 10) Both BJP and Congress, more so the latter, has too many leaders, which is disproportionate to their mass following. This means more aspirants for same MLA seat or CM gadi. Both KJP and JD-s has relatively more mass base compared to well known leaders to win over voters in the local leve. This is a big negative and a small positive. The good thing is that, it can encourage rebels fromBJP and Congress. The problem is that after the elections,some of these winning rebels (with the support of JD-S) can be bought by any one who has money. Nevertheless, large number of Congress candidates may get defeated due to rebellion and muliti-cornered contests. If we agree with the above facts, then it is easy to see that, BJP will go back to 25 seats (maximum 40) which is its average performance level before the implementation of Mandal. Ananth Kumar dooes not believe, just like many BJP followers, that he can win Karnataka election only with Brahimin votes. His imediate agenda is to capture Karnataka BJP even if it require the demolishing of BJP temporarily. Congress gets 25% of Lingayats, more than half of Muslim votes, and more than half of Kuruba votes in the Old mysore region, and SC votes. It wont get any Brahmin votes and Vokkaliga votes. But as there is a lack of alliance between Lingayats and Vokkaliga under same banner, Congress will gather all left-over votes from across regiona and across communities and will get a massive victory. JD-S will make surprise inroads in some of the strongholds of erstwhile Janata Parivar JH Patil followers. JD-S will become the main opposition party this time. As Siddaramaiah is impulsive and arrogant and he has no means to mobilize party fund (how can a relatively honest person collect funds?) , rebellion will start son after he becoming the CM. Once Siddaramaiha walk out of Congress after UPA’s election debacle in the 2014 Loksabha elctions, (or one or two years after that), Congress will be wiped out in Karnataka. It will continue to exist as a regional party with a different name. Janata Dal will move futher right under the leadership of businessman Kumara Swamy and it will cease to be a party of farmers. Each time Kumaraswamy mobilize party, it will disintegrate as the selfish, power greedy, money greedy second rung leaders of JD-S will keep hoping from this to that or fom that to this just like fishes in the ponds during rainy season. But JD-S will play a role in Karnataka politics along with Congress from some time to come. Siddaramiah’s Government can last only for one or two years mainly because the Congress may start disintegrating after the Loksabha elections at the natioanl level. Most regional leaders would try to fom regional outfits and then start searching for regioanl alies. JD-S and Sidharamaiah may come together once again, especially because, Kumaraswamy may play a greater role in politics. Also, once Sidharamiaha become Chief minister for one year, his obsession form Chief minister pst also may come down a little. But if Sidharamaiah remain actively with Congress for long term, that will be a miracle. KJP and Yeddyurapa may wish to come back to BJP only if BJP can form a government at the center after the next Loksabha election. That is a very remote possibility. How long Lingayat Maths will support One man-One woman party by sacrificing all its commercial interests is a big question. I think Yeddyurappa and Shobha will remain relevant and active for long, simply because they are very intelligent political leaders. Sidharamaiah may be relatively honest, but that is not enough to survive in politics. I am going to be very happy after this election simply because I dont need to keep noticing that face – SM Krishna. Am I the only person in Karnataka who is fed up with the advices and appeals of selfish corporate heads like majumdar, murthy and kheny? I think world will definitely be a nicer place . As of now all these are possible, thanks to the mess Congress has made in its ticket selection. The only thing one can conclusively say is that there is no chance of Shettar or Yeddy becoming CM. Other than that all other options are open. If Cong wins, Madam will opt for Kharge and leave Siddu high and dry. HDK as CM with BJP support is also an option. @ Simple, ‘Ideology of the party is important’. It means Congress has ideology but no idealistic leader! – For that matter, no leader fit enough to be projected. Congress is cashing on the failure of BJP and not on its own strength (if it has any). Votes will not fall in the kitty automatically. You have to present your strength, ideas etc. Don’t be too confident. Who knows, Cong may have to beg for support from others! By the way Do scams and non-governance fall under the category of ideology?! Congress has lost momentum since March end, people are shocked at the infighting in KPCC. Without power this is the situation, what would be the state of affairs if Congress gets the magic number—– more dissidence than we saw in bjp. Only credible leadership option in karnataka today is HDK. People recognise that. Just got a automated campaign call from HDK on my phone. Happy to see that the “dynamic” leader to take up new technology to reach out to the public. Disappointed to see that the call was in English and not in Kannada. Does HDK assume that all residents of Bangalore are non-Kannadigas? BJP having failed and Congress being in a mess, with infighting and no leader to project, JD may get the benefit. I only hope HDK will be able to give a good governance with the tag line: Kannada, Kannadigas and Karnataka first. Jd s if it comes to power, it would be because of REGIONAL PARTY phenomenon. Kannada, kannadiga, karnataka should be the core issue. It is basis. Any deviation from this point by any karnataka politician is objectionable. I was very impressed by JD S manifesto, very good. I too recd that call, and it made sense . >If Cong wins, Madam will opt for Kharge and leave Siddu high and dry. The bigger problem with a congress win, We will have ‘Vadravatara’ doing its rounds in Karnataka, and perhaps all peripheral villages will be owned by the ‘Damaad’. And for that to happen, perhaps Kharge is a better conduit than Siddu..
At times I feel, we may be better of with the local corruption of BJP than the ‘global’ corruption of Congress. Whatever the assumptions come from all of us , There will be different issues in each constituencies . So for all those issues and how local leaders act over there plays major role for winning. Overall like this issues can reverse the poll predictions . Even the biggest leaders of big parties may loose and even the lesser known ,but popular in local level from all these 5 – 10 years may win the game. So choosing and giving opportunity to these few candidates is the main point for winning the election overall . So by this point people from over 50 to 80 constituencies choose their representative. In this calculations BSY AND HDK , both of them have chosen good candidates so kjp and jds will surely gain some extra seats.I assume around 45-55 seats ton KJP and 35-45 seats to JDS . Lacs of crores Frauds of Congress Every Day Is The people of India Mad ,,,,,,,,,,,,,,,,,,,,Why Congress I am feeling Ashamed ……. @harkol, My guess is if Cong wins, Moily will be picked. “JD-S will make surprise inroads in some of the strongholds of erstwhile Janata Parivar JH Patil followers. JD-S will become the main opposition party this time.” — This was one of my “prediction” (in fact just an observation). Which went wrong in technical terms. However, I am still waiting for Periyapatna results to see which party will become the main opposition party in Karnataka. An interesting thing is, this time, more BJP MLAs may resign from that party to join other groups. There is some reason for this..
1)If you have been running a pan shop/pettiyangadi for two decade, even if you have a small loss for two consecutive years, you may be stll in the business. But if you are running a fast food restaurant on MG Road, you may not be able to survive more, if you make continuous losses. In some constituencies, according to some rumours, BJP workers just collected money from party center but didnt distribute it to voters properly. They thought that any way they wont win, then instead of wasting money some of them pocketed part of it. The expense of running BJP in Karnataka is huge compared to the expense of running Karnataka Makkal Party by Ashok Kheny. (even if the money spent in one particular constituency is more). BJP can never chose not to focus on any Vidhan Soudha constituency. They are compelled to put maximum efforts to win each vote in the next Loksabha election. This means, they have to spend more money in every ward in Karnataka. And if the local activists surely believe, there is no chance of getting any vote, they money pumped by party center will end up in the pockets of local activists and workers, Remember, running a political party is a big expensive business. No political party business can last for long years, without getting any results. If the Taluk level leaders fail to ensure some or other benefit to the local level workers, they will either become inactive or will jump to other parties. When all local activists jump to other parrties, leaders will also be forced to abandon their parent party. 2) When BJP and NDA fail to get Prime Minister post in the next Loksabha electionl, many of its MPs will try to break away from BJP and will try to become part of a national Alliance. 3) There is a chance that initiallly, Siddaramaiah will become the chief minsiter. But how long? In this context, the Congress govt may fall and many MLAs from it will join to support other leaders. In short, BJP will slowly become an insignificant force in Karnataka, in the coming years.